One of the most significant features added since the previous version is full ARM NEON support. All algorithms bundled with KFR 1.0 already optimized for armv7, armv7s and aarch64 (arm64). KFR produces code optimized for latest Intel and AMD processors as well as for legacy ones. In addition to optimized ones, generic implementation of vector functions is available for all other architectures. 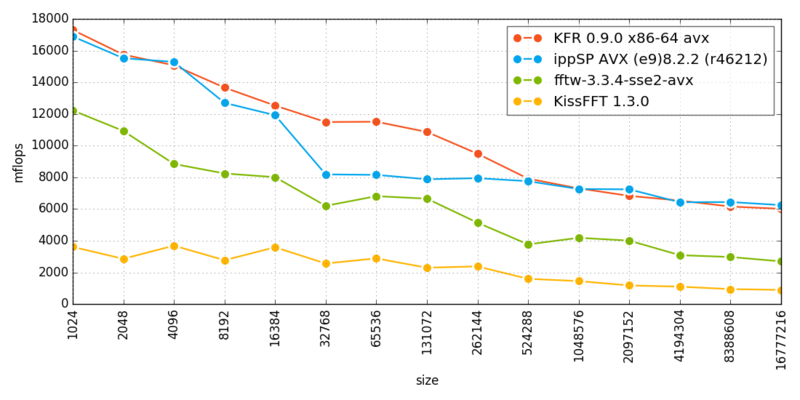 Our FFT implementation is fastest according to recent benchmarks. In version 1.0 compilation of FFT also became faster. Moreover, full support of complex numbers makes using of FFT a lot easier. You can now convert left/right to mid/side and vice versa in one pass. Both split and interleaved format are supported. Removing DC bias is as easy as calling one function. Oscillators in KFR framework is both accurate and fast, so you can use more oscillators or use higher sample rate to achieve even better quality. In addition, incremental oscillators is also available. KFR framework contains fast implementations of both Finite and Infinite Impulse Response filters, FIR filter design using window method and set of functions to easily setup biquad filters. As of version 1.0.0 the following functions have been added: upsample2, upsample4, downsample2 and downsample4. In combination with FIR filter you can archieve high quality results with minimal code. Build time has been reduced by 10-50% (depending on the used algorithms and code size).